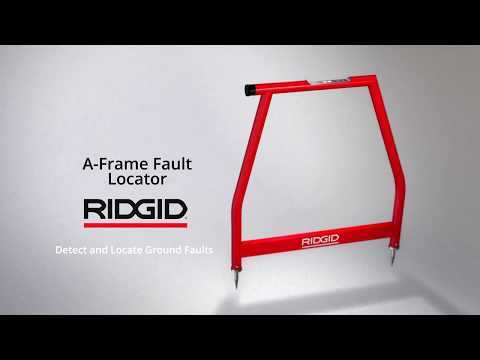 The RIDGID® A-Frame Fault Locator is a purpose built system to simplify the location of ground faults in direct buried insulated wire. Dimensions (LxWxH) 8.5" x 5.8" x 2.5"
Dimensions (LxWxH) 30.3" x 30.4" x 1.5"
A-Frame Fault Locator is rated 5.0 out of 5 by 2. Rated 5 out of 5 by SCsprinklerGuy from Great Product We just purchased the Ridgid A-Frame fault finder & are very impressed with it. We do irrigation repair & it works perfect for finding cut & damaged wires, it even peaks over valve solenoids. The transmitter included with the A-Frame has several frequencies and works great with the Ridgid Seektech SR-20 locator. I have used several older style fault finders, you all know the ones with the manual gauge & you follow the direction of the needle kick. This is such a better product than those & is actually made to last. For just a little more in price I highly recommend stepping up to the Ridgid line of location equipment, the tools will really save time and make money.